This book covers key tin whisker topics, ranging from fundamental science to practical mitigation strategies. The text begins with a review of the characteristic properties of local microstructures around whisker and hillock grains to identify why these particular grains and locations become predisposed to forming whiskers and hillocks. The book discusses the basic properties of tin-based alloy finishes and the effects of various alloying elements on whisker formation, with a focus on potential mechanisms for whisker suppression or enhancement for each element. Tin whisker risk mitigation strategies for each tier of the supply chain for high reliability electronic systems are also described. Mitigating Tin Whisker Risks: Theory and Practice is intended for the broader electronic packaging and manufacturing community including: manufacturing engineers, packaging development engineers, as well as engineers and researchers in high reliability industries. GREGORY HENSHALL is Master Engineer at Hewlett-Packard Company in Palo Alto, California. He has more than twenty years' experience in materials research and development, including twelve years of experience with soldering alloys and electronics manufacturing and nine years focused on lead-free technology. Dr. Henshall currently serves as chair for the iNEMI (International Electronics Manufacturing Initiative) Lead-Free Alloy Alternatives Project. JASBIR BATH is the owner of Bath Technical Consultancy LLC in Fremont, California. He has over fifteen years' experience in research, design, development, and implementation in the areas of soldering, surface mount, and packaging technologies working for companies including Flextronics International/Solectron Corporation and ITRI (International Tin Research Institute). Bath has been chair of various iNEMI lead-free consortia involving OEMs, EMS, and component and material supplier companies on alloy selection, assembly, and rework. CAROL A. HANDWERKER is the Reinhardt Schuhmann Jr. Professor of Materials Engineering at Purdue University, Indiana. Previously, she was chief of the Metallurgy Division at the National Institute of Standards and Technology (NIST), where she participated in the NCMS (National Center for Manufacturing Sciences) Lead-Free Solder Project and co-chaired the iNEMI Lead-Free Alloy Selection Team. Dr. Handwerker is currently active on the iNEMI Technical, Research, and Environmental Leadership Steering Committees, as well as a participant in a range of iNEMI project teams. 1. Regulatory and Voluntary Drivers for Environmental Improvement: Hazardous Substances, Lifecycle Design and End of Life (John Hawley). 1.2 Substances of Environmental Concern. 1.3 Design for Environment/Energy Efficiency. 2. Lead-free Surface Mount Technology (Jasbir Bath, Jennifer Nguyen and Sundar Sethuraman). 2.2 No-clean and Water-soluble Lead-free Pastes. 2.4 Board and Stencil Design. 2.5 Screen Printing and Printability of Lead-free Solder Pastes. 2.7 Component Placement (Paste Tackiness). 2.8 Reflow Soldering and the Reflow Profile. 2.9 Effect of Nitrogen versus Air Atmosphere during Lead-free Reflow. 2.10 Head-in-Pillow Component Soldering Defect. 2.11 Solder Joint Visual Inspection. 2.12 AOI (Automated Optical Inspection). 3. 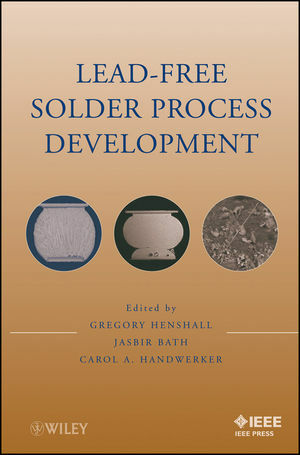 Lead-free Wave Soldering (Dennis Barbini and Jasbir Bath). 3.1 Wave soldering process boundaries. 3.2 Soldering temperatures on the chip and main soldering waves. 3.3 Alloys for Lead-free Wave Soldering. 3.4 The function of nitrogen in wave soldering. 3.5 The effect of PCB Design on wave solder joint formation. 3.6 Standards related to wave soldering. 4. Lead-free Rework (Alan Donaldson). 4.2 Surface Mount Technology (SMT) Hand Soldering/Touch-up. 4.6 Through-hole Hand Soldering Rework. 4.7 Through-hole Mini-pot/Solder Fountain Rework. 4.8 Best Practices and Rework Equipment Calibrations. 5 Lead-Free Alloys for BGA/CSP Components (Gregory A. Henshall). 5.2 Overview of New Lead-Free Alloys. 5.3 Benefits of New Alloys for BGAs and CSPs. 5.5 Management of New Alloys. 6 Growth Mechanisms and Mitigation Strategies of Tin Whisker Growth (Peng Su). 6.2 Role of stress in whisker growth. 6.3 Understanding standard acceleration tests. 6.4 Plating process optimization and other mitigation strategies. 6.5 Whisker growth on board-mounted components. 7. Testability of Lead-Free Printed Circuit Assemblies (Rosa D.Reinosa and Aileen M. Allen). 7.2 Contact Repeatability of Lead-Free Boards. 7.3 Probe Wear and Contamination. 8. Board-Level Solder Joint Reliability of High Performance Computers under Mechanical Loading (Keith Newman). 8.2 Establishing PWB Strain Limits for Manufacturing. 8.3. SMT Component Fracture Strength Characterization. 8.4 PWB Fracture Strength Characterization. 8.6. Solder Joint Fracture Prediction – Modeling. 9. Lead-Free Reliability in Aerospace/Military Environments (Thomas A. Woodrow and Jasbir Bath). 9.3 Lead-Free Control Plans for Aerospace/Military Electronics. 9.4 Aerospace/Military Lead-Free Reliability Concerns. 10. Lead-Free Reliability in Automotive Environments (Richard D. Parke). 10.1 Introduction to Electronics in Automotive Environments. 10.2 Performance Risks and Issues. 10.3 Legislation Driving Lead-Free Automotive Electronics. 10.4 Reliability Requirements for Automotive Environments. 10.5 Failure Modes of Lead-free Joints. 10.6 Impact to Lead-free Component Procurement and Management.